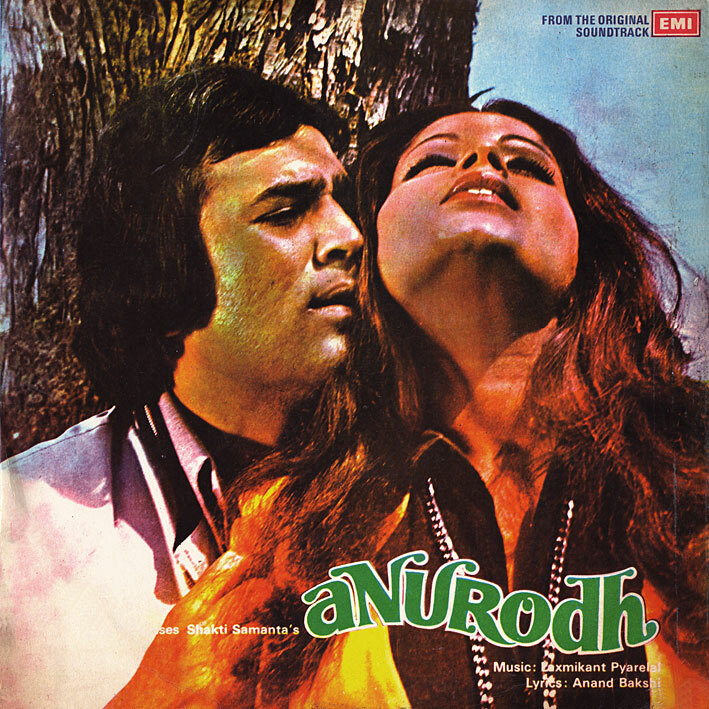 I'm on the fence about 'Anurodh'. Made during what I consider Laxmikant Pyarelal's least interesting couple of years (based on the stuff I've heard), it's the sort of soundtrack I have trouble qualifying. On the one hand I find every single melody forgettable (I've played the record four or five times and I'm unable to recall any of them), on the other hand I sort of appreciate its sparse arrangements including quite a few nice little instrumental details scattered throughout. Like the cool piano solo midway through 'Aapke Anurodh Pe', the atmospheric intro to 'Mere Dil Ne Tarap Ke' as well as a couple of pizzicato strings and saxophone interludes, and the variety of breaks on 'Aate Jaate Khoobsoorat' (accordion, mandolin, glockenspiel). The latter song also has a pleasant poppy groove and is the track I'd be most likely to return to. Otherwise this is an album probably not so much for me… one to find bits to sample from, if I'd been in the sampling business. Which I'm not. Great Share PC, Shakti Samanta mostly used R. D as his first choice Music Director after Aradhana but in this very album He used Laxmikant Pyarelal, as duo were on the top of their musical carrier and 1970 to 1985 they were undisputed King of Hindi Film Music. Another great musical blockbuster of 1977 by PC ,The film grossed 6 crores at the box office in 1977 as wiki..
all score by music maestro duo L-P was hits, but my most fav. track 2. Kishore Kumar: Mere Dil Ne Tarap Ke. great rip quality, but i think one of track missing from this album.. "Jab Dard Nahi Tha Seene Mein"
Thanks dear for this album..
Amritpal Singh, "Jab Dard Nahi Tha ... " is listed as "Na Hansna Mere Gham Pe" Pl check. No. Singh Saheb song " Jab Dard Nahi" is very much here, it is 6th song. waiting eagerly for new upload.